The National Park Service's National Register of Historic Places, Scenic America, the Virginia Department of Historic Resources, and the National Conference of State Historic Preservation Officers proudly invite you to explore Journey Through Hallowed Ground, featuring historic places on and near Route 15 in Virginia's Piedmont. 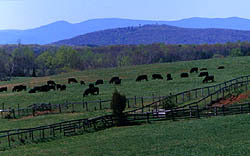 The Northern Virginia Piedmont region (part of an upland plateau extending from Virginia to Alabama) is a scenic and historically rich landscape that has "soaked up more of the blood, sweat, and tears of American history than any other part of the country," according to the late historian C. Vann Woodward. "It has bred more founding fathers, inspired more soaring hopes and ideals and witnessed more triumphs, failures, victories, and lost causes than any other place in the country." 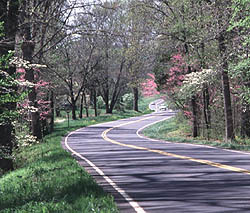 Meandering through more than 75 miles and nine counties of Virginia hillside, U.S. Route 15 and State Route 20 form the spine of the Piedmont. This Discover Our Shared Heritage Travel Itinerary explores 65 historic places that evoke in vivid detail the soldiers, statesmen, farmers, and slaves who fought, toiled, and governed in the Virginia Piedmont. Most of this area is now part of the Journey Through Hallowed Ground National Heritage Area. The National Heritage Area encompasses four states spanning 180 miles from Gettysburg to Monticello. It includes 9 presidential homes, 13 National Parks, and a handful of battlefields commemorating the French and Indian War, Revolutionary War, the War of 1812, and the Civil War. The Heritage Area provides visitors with the opportunity to “celebrate and preserve the vital fabric of America which stands today in the historic, scenic, and natural beauty of this region.” Discover the places where “America happened“and experience one of the most historic regions in the country. To learn more about Heritage Area and all of its sites and view maps, educational resources, and up-to-date information visit the Journey Through Hallowed Ground website. This itinerary focuses on the variety of buildings and landscapes that comprise the Virginia Piedmont. The Piedmont witnessed some of the bloodiest battles in the Civil War, now reflected in historic landscapes such as Manassas and Ball's Bluff National Cemetery, one of the nation's smallest military burial grounds and the site of a disastrous Union defeat in the first year of the Civil War. Madden's Tavern, built in 1840, is a rare surviving example of pre-Civil War black entrepreneurship in rural Virginia, first owned and operated by Willis Madden and now owned by his descendants. Numerous small towns, such as Culpeper or Warrenton, contribute to the character of the region, as do the green expanses of rural historic districts such as Madison-Barbour and Green Springs. This verdant region has been called the "cradle of democracy": Thomas Jefferson, James Madison, and James Monroe each made their home here--estates that visitors can visit today. The great Supreme Court Chief Justice John Marshall used his Fauquier County home as a retreat. Jefferson's significant imprint on this region is evident not only at his home Monticello, and the "academical village" of the University of Virginia, but also at lesser known sites such as the unusual ruins of Barboursville, remains of a Jefferson designed house that burned in 1884. Journey Through Hallowed Ground offers numerous ways to discover the historic properties that played important roles in Virginia's past. Each property features a brief description of the place's significance, color and historic photographs, and public accessibility information. At the bottom of each page the visitor will also find a navigation bar containing links to three essays that explain more about Piedmont History, the Civil War, and Preserving the Piedmont. These essays provide historical background, or "contexts," for many of the places included in the itinerary. The itinerary can be viewed online, or printed out if you plan to visit the Piedmont region in person. Created through a partnership between the National Park Service's National Register of Historic Places, Scenic America, the Virginia Department of Historic Resources, the National Conference of State Historic Preservation Officers (NCSHPO), and the National Alliance of Preservation Commissions (NAPC), Journey Through Hallowed Ground is an example of a new and exciting cooperative project. As part of the Department of the Interior's strategy to revitalize communities by promoting public awareness of history and encouraging tourists to visit historic places throughout the nation, the National Register of Historic Places is cooperating with communities, regions and Heritage Areas throughout the United States to create online travel itineraries. Using places listed in the National Register of Historic Places, the itineraries help potential visitors plan their next trip by highlighting the amazing diversity of this country's historic places and supplying accessibility information for each featured site. In the Learn More section, the itineraries link to regional and local web sites that provide visitors with further information regarding cultural events, special activities, and lodging and dining possibilities. Visitors may be interested in Historic Hotels of America, a program of the National Trust for Historic Preservation. Scenic America is the fifth of more than 30 organizations working directly with the National Register of Historic Places to create travel itineraries. Additional itineraries will debut online in the future. The National Register of Historic Places and Scenic America hope you enjoy this virtual travel itinerary of the Piedmont's historic resources. If you have any comments or questions, please just click on the provided e-mail address, "comments or questions" located at the bottom of each page.